Bad weather? Hazardous worksite? Out hunting? Shield your feet from harm, water, mud and more with these neoprene steel toe boots! Honeywell is known for designing top-quality products you can rely on - day in and day out. 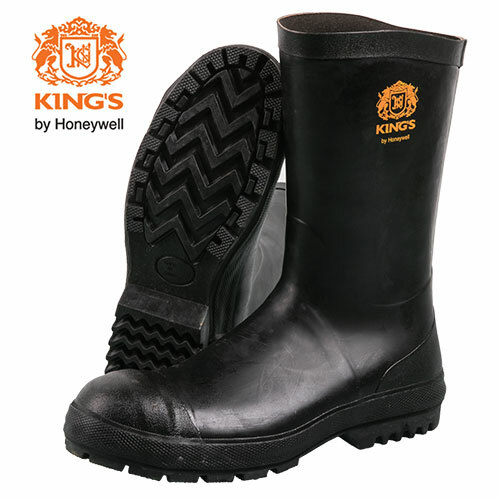 So you know that you can depend on the foot-pampering performance and protection of these 12" Kings boots. They have a triple-dipped neoprene design that's seamless, 100% waterproof and chemical resistant. Plus, they have durable moisture-wicking fabric linings, steel toe, ASTM electrical hazard outsole and self-cleaning V-Wave tread that squeegees away water and debris for secure footing. Color: Black. Mens size 12.